Ironing... one of those tasks none of us would do if we could get away with it. Well, you can! Our top Edinburgh cleaning firm offer a great ironing services all across Edinburgh so that you don't have to. We know you'd rather put your feet up at the end of a busy day at work, so why not. Let us get your ironing and laundry done for you so you have more time to have fun with your family. Our ironing service is one of the best in the city, because we really care about what we are doing and the people that we are doing it for. 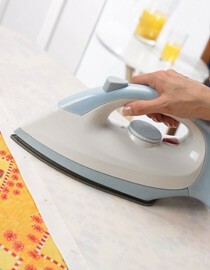 We believe that our ironing service is probably one of the fastest and most inexpensive in Edinburgh! Give us a call on 0131 513 9073 and we can give you a free quote over the phone for our ironing service so that you can see just how much you could benefit from our experienced cleaners!